Reel Paradise is an immense Vacation Rental Home featuring 6 Bedrooms and 5 full Bathrooms. There are 4 King Beds and 4 Twin beds total with ample bathrooms for the entire family. 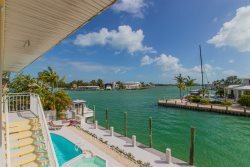 This beautiful home is located in the prestigious Key Colony Beach community just minutes from the Vaca Cut Bridge. The spacious main floor of this home features 2 Master Suites, 2 guest bedrooms, and 4 bathrooms. Enjoy preparing meals for the family in the gorgeously remodeled main kitchen. There is an additional bar kitchen with a full-size refrigerator and an additional dishwasher to ease the cleanup process for the duration of your stay. Relax in the open living area large enough to fit the entire family and walk out to the massive waterfront balcony with seating to enjoy the breathtaking views. The entry-level of the home offers 2 bedrooms with King-size beds, 1 bathroom and an additional kitchenette including a refrigerator, dishwasher, microwave, large sink area and tons of space (no stove). Access the covered patio from the bedroom or lower living area leading you to the pool, spa, boat dock, 6-foot fish cleaning station with stunning views. Enjoy the bars, restaurants, and local shopping that is just a short drive away and nestled in the heart of Key Colony Beach. This rental also comes with access to the Cabana Club which offers a private sandy beach, heated pool, hot tub, snack bar, full drink menu and game room for the kids. Book your stay in "Reel Paradise" today! full - size crib with bedding. Great responsiveness from the service team when texted with an issue. Maintenance staff very friendly and helpful. Very relaxing and enjoyable week. Loved the community and location! Great home. The team members are so friendly and helpful!